The Zohar, Chapter “Otiot de Rav Hamnuna Saba (The Letters of Rav Hamnuna Saba),” Item 31: This is the playing of the Creator with each of the twenty-two letters, by giving each room to show her governance according to His wish until they sort out by themselves—out of their own desire—which of them is worthy of leading the world. This is why it was said that 2,000 years before He created the world, the Creator was looking and playing with them. The Light created the Kelim upon four phases of expansion. Then a restriction took place whereby a screen was established and Malchut decided to receive pleasure only for the sake of bestowal. That is how she interacts with the Light, the Creator, becoming similar to Him according to the law of equivalence of form. Malchut wants to adopt the quality of Bina and in the process of doing this work, 22 forms of the desire for pleasure form inside her. It’s as if this quality is outlined and comes through by these contours, which accumulate to the degree that Malchut connects to Bina. Initially the desire is formless like clay, but when it takes on the 22 forms of Bina, together they cause the desire to be similar to the Creator. So which of these forms is worthy of being the foundation by which the world is created? Which of them connects the beginning and end of creation? Which leads all the other forms after her? This is talking about the key intention, the main action, the calculation for making a striking interaction (Zivug de Hakaa) which is always done in the head of a Partzuf. Following the reverse order, meaning from the side of the Kelim, all the letters appear before the Creator, or in other words, they raise MAN, a request. In reponse each of them receives MAD, an answer, telling it whether it is possible to create the world with it or not. If no impurity latches on to the answer, it means that this is that very form. If, however, in response to the request from Above a force comes, but next to it Klipa awakens as well, then the world cannot be created using that form. The outline of all the letters is precisely determined. Every detail of the letters is a geometrical symbol of a certain spiritual quality, produced by the combination of bestowal and reception. That is why Hebrew writing has remained unchanged over the course of millennia. All other alphabets changed with time, sometimes even to the point of becoming unrecognizable, whereas the forms of the Hebrew letters are fixed by the combination of spiritual forces and are therefore preserved throughout the centuries. The horizontal details of the letters’ outlines symbolize the influence of the Light of Hassadim, while the vertical ones symbolize the influence of the Light of Hochma. Hassadim belongs to the force of Bina, while Hochma belongs to the force of Malchut. This can be compared to an oscillograph, whose signal is also made up of the interaction of two scales. In fact, all the pictures in our world are also based on the combination of two forces, although there is also chronological development superimposed on them. This is caused by the intrusion of Klipa, which “stretches” the process in time. As a result, a difference emerges between the beginning and the conclusion. To the degree we correct the forces of impurity, they join the single whole, bringing the initial and final states closer until reaching total unity. Then the very notion of time disappears. I had a meeting that was recorded with Dan Kaner, the anchorman of radio Kol Israel and a popular Television host in Israel. Dan Kaner is a true master of the Hebrew language, with extraordinary knowledge of its intricacies, origin, history and evolution. 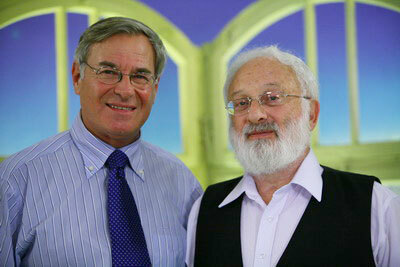 Therefore, it was a real pleasure speaking to him about the Hebrew language as used in Kabbalah. By origin, Hebrew is a symbol for the forces operating in the universe. It harmoniously expresses the essence of man and nature through letters and symbols (TANTA). Combining and ordering the letters to form words and sentences is a means to describe the order of the creature’s creation and correction, all the way until the full correction – similarity to the Creator or Light. The Torah exemplifies this order. Knowing what forces and actions are indicated by the letters enables one to move all along the process of creation, to become incorporated in it at different stages, and to thereby gain a better understanding of the Creator’s plan. Dan was very impressed with the wealth that the language of Kabbalah offers in describing the Hebrew language, the sensations that every letter evokes when interpreted Kabbalistically, and the music of feelings that plays in the combination of letters. He understood that Kabbalah enables one to enter the world of letters, symbols, forces and desires – to feel them and their filling with the Light.